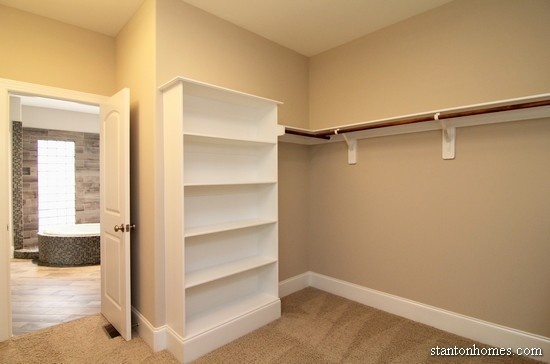 How large should a Master Closet be? New home floor plans can include walk in closets that range anywhere from 25 sq ft to the size of a bedroom (100 sq ft or more). Below, find examples of Raleigh new home master closet layouts with photos of walk in closet storage, built-in mirror walls, windows, custom shelving designs, and much more. 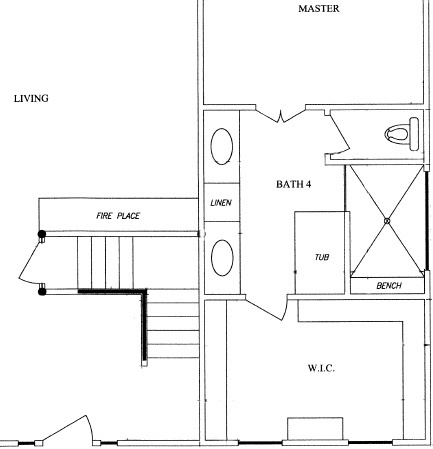 Click on any photo to see the floor plans for the home pictured. 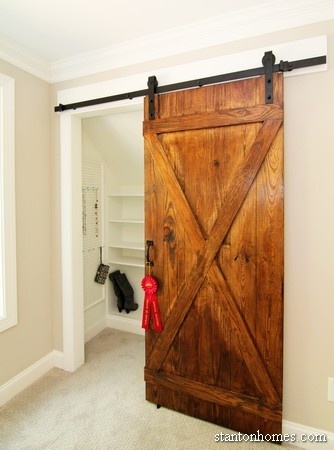 What is the average walk in closet size for Raleigh new homes? The standard width of a walk in closet can range from 5' to 12'. This is important because the minimum 5' width maintains a 3' hallway into the closet, even after you hang clothing along the walls. The standard depth of a walk in closet can range from 5' (for a square room) to 17' (for a bonus-room-style closet). 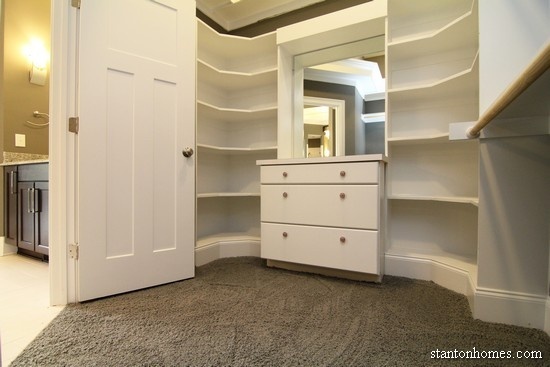 If the average walk in closet size starts at a 5'x5' space, how large is this master closet? 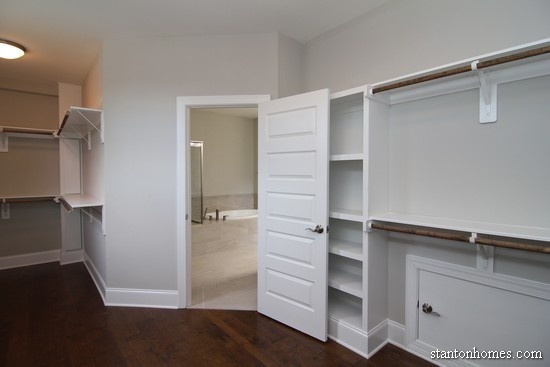 This master closet is approximately 172 sq ft - larger than average, and more common for luxury new homes in Raleigh. 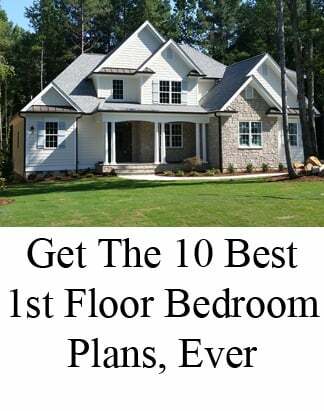 Click here to see the floor plans for this master suite - a version of the Serengeti built near Raleigh, NC. What is the distance between clothing rods in a walk in closet? Most walk in closets combine a variety of storage types, including cabinets with drawers, open shelving, and hanging rods. Double rods are typically placed at 40 and 80 inches from the floor. Rods designed for tall garments are typically placed at least 72 inches from the floor. This Raleigh new home master closet is about 14.5' x 11.5' (with a square center island cabinet). When does a walk in closet need a window? This Raleigh new home - by Stanton Homes - features a downstairs master bedroom with his and hers style closet. The window wall shelving was extended outwards to create more storage space and a separate "his and hers" layout. The walk in closet is about 14' x 9'. Although windows are not necessary for closets, they can be added by a custom home builder to keep balance and visual appeal on the exterior of the home - especially when the closet is located on the front face of the home. Master walk in closet from The Bryson - see the floor plan here. Master walk in closet from The Remington - see the floor plan here. Master walk in closet from The Bennett - see the floor plan here. What are the minimum dimensions for an accessible walk in closet? 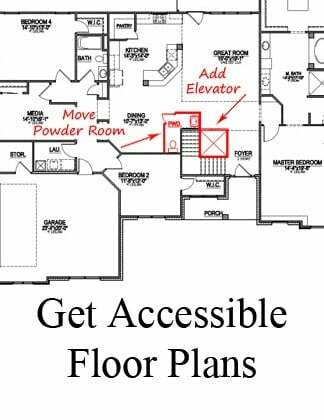 Accessible closets must allow enough space for a full wheelchair turning radius. This Raleigh new home master closet is about 14.5 x 11.5 ft (with a square center island with base cabinets). It includes a 36" door and plenty of turning radius. Store bulky items - like winter coats - in designated coat closets in the foyer, mudroom, or upstairs. 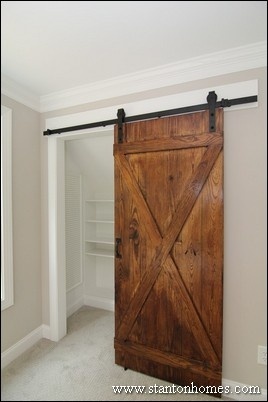 These items can take up significant space, if you're focused on minimizing the master walk in closet size. 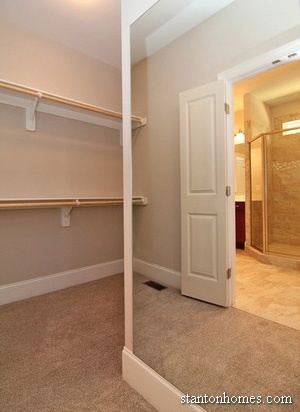 This Raleigh new home master closet is about 10' x 17' (with 9' island). 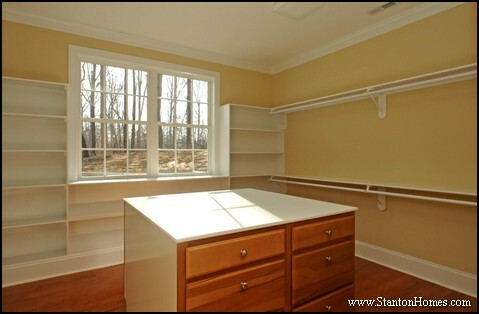 This Raleigh new home master closet is about 13.5' x 7' (with a washer and dryer area built in). 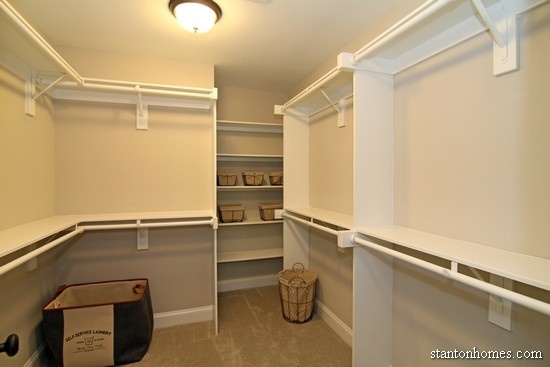 Looking for ways to add closet storage to your new home floor plan? 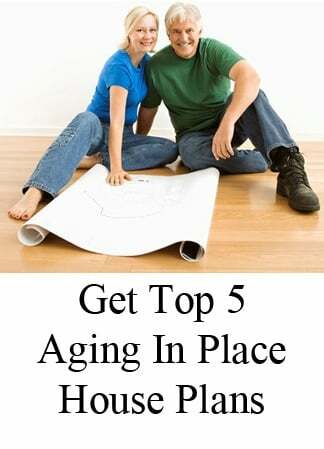 Ask the builder for easy floor plan modification ideas. 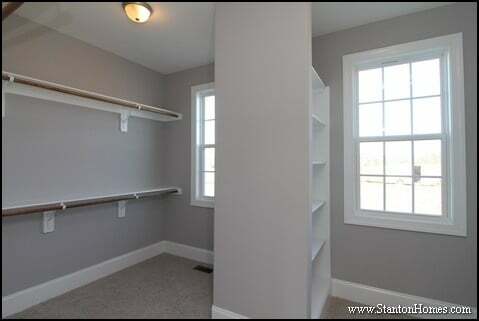 When you build a custom home, the "standard" size of any room - including a closet - is very flexible. 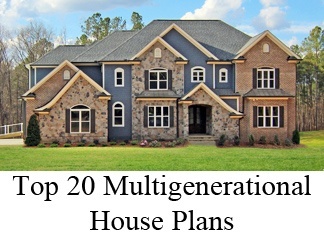 As your considering floor plan options, contact custom home builder Stanton Homes. 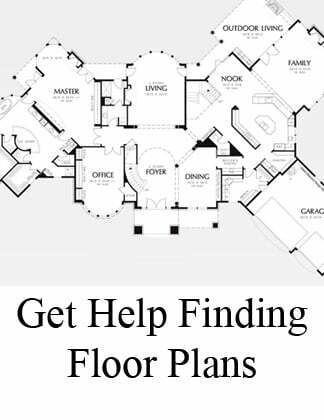 We'll help you find the right floor plan - even if it means modifying room sizes and layouts. What's the best size for a walk in master closet? 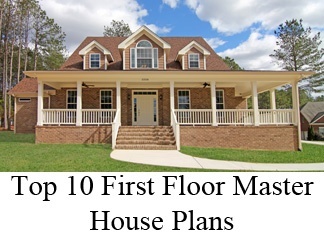 Most new home floor plans include walk in closets in the master bedroom. 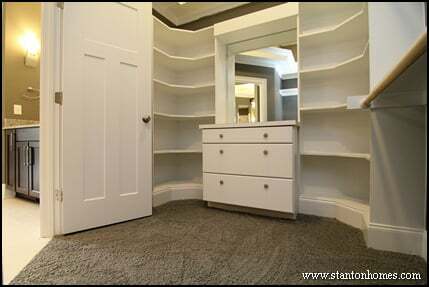 Walk in closets can range anywhere from 25 sq ft to a the size of a bedroom (100 sq ft or more). This custom home master closet is about 14.5 x 11.5 ft (with a square center island designed as a folding counter and cabinet). How wide does a walk in closet need to be? What is the average length of a walk in closet? The standard width of a walk in closet can range from 5 to 12 feet or more. This allows for a 3-foot hallway into the closet, even after you store or hang items along the walls. The standard depth of a walk in closet can range from 5 feet (for a square room) to 17 feet (or more for a bonus room style closet). This custom home master closet is about 10 x 17 ft (with a 9' island cabinet). What is the best distance between closet rods? 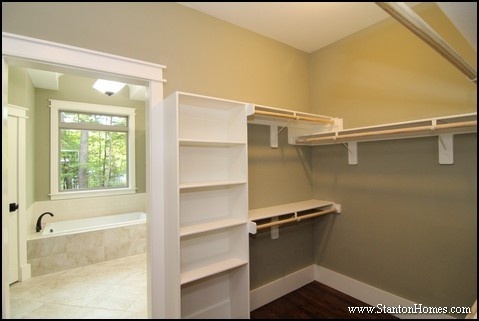 This custom home master closet is about 13.5 x 7 ft (and is designed to include a washer and dryer). 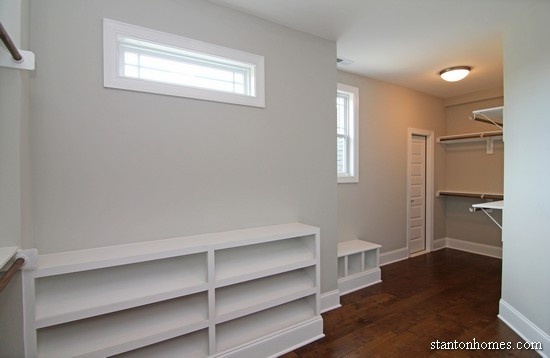 Got walk in closet ideas with a window? Walk in closets sometimes incorporate windows, typically in floor plans where the closet is located on the front of the home. Here is the completed walk in closet. The window wall shelving was extended outwards to create more storage space and a separated his and hers design. 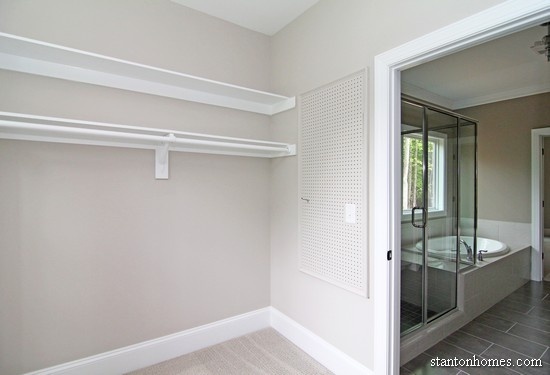 This custom home master closet is about 14 x 9 ft.
Windows are not necessary for closets, but are sometimes added in order to keep balance and visual appeal on the exterior of the home, especially when the closet is located on the front face of the home. How small can a walk in closet be? What is the right size for a wheelchair accessible walk in closet? 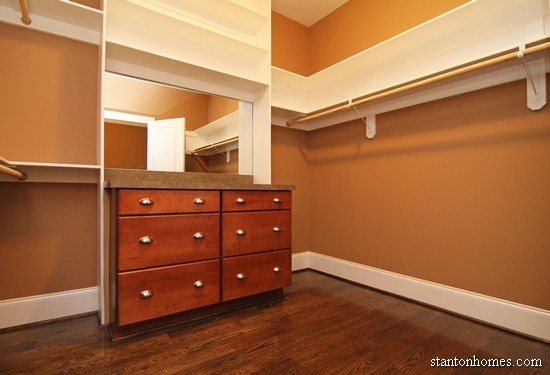 This custom home master closet is about 14.5 x 11.5 ft (with a square center island cabinet). It includes a 36" door and plenty of turning radius. How large should a shoe or accessory closet be? Most new home plans include one - or even two - walk in closets in the master suite. 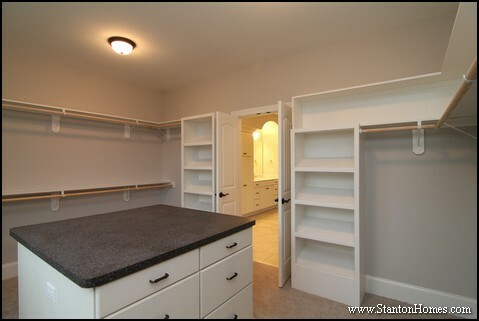 Custom home walk in closets can range anywhere from 25 sq ft to a the size of a bedroom (100 sq ft or more). 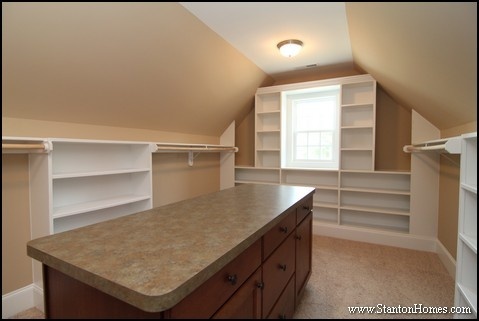 This custom home master closet is about 14.5 x 11.5 ft (with a square center island cabinet). What is the average size of a walk in closet? The standard width of a walk in closet can range from 5 to 12 feet or more. This maintains a 3-foot hallway into the closet, even after you store or hang items along the walls. The standard depth of a walk in closet can range from 5 feet (for a square room) to 17 feet (or more for a bonus-room-style closet). This custom home master closet is about 10 x 17 ft (with 9' island). What is the distance between clothing rods? This custom home - design by Stanton Homes - features a downstairs master bedroom with his and hers style closet.